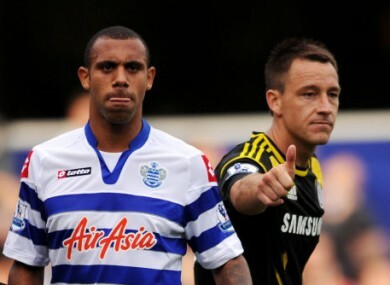 RIO AND ANTON FERDINAND will reportedly refuse to wear ‘Kick It Out’ t-shirts during this weekend’s Premier League fixtures, in protest at the Football Association’s handling of the John Terry controversy. Terry was handed a fine and a soft four-game ban for racially abusing Anton during last year’s clash between QPR and Chelsea at Loftus Road, while the Blues have not disclosed what disciplinary action they plan to take against the former England captain. Reading striker Jason Roberts is another player who plans to boycott the wearing of the t-shirt after Terry decided against appealing the FA’s punishment. The former Wigan player said that it is now up to Chelsea to make an example of Terry, something that the FA have failed to do. He said: “You know we’ve sat and we’ve spoken about the Serbian FA and their view of what happened out there with the England Under-21s and how you have to take responsibility. “I think for a club like Chelsea, if you find yourself in the middle of this, you have to be seen to be doing the correct thing and the correct thing is to be taking action against someone who has done something like that in the game. “If you used that sort of language in the workplace, what sanction would you expect to be given? I don’t know. You say about fans saying it on the sidelines and what would happen to them? Manchester United manager Alex Ferguson, however, has condemned Roberts’ stance and expects that Rio Ferdinand will wear the t-shirt in the warm-up for Saturday’s game against Stoke City. “I have to disagree with Jason Roberts. I think he is making the wrong point,” Ferguson said. “Everyone should be united, with all the players in the country wearing the Kick it Out warm-up tops. Ferguson believes that nothing will be gained by players refusing the wear the slogan, and doesn’t want one of the game’s most prominent players, in the form of his central defender, to swim against the stream. “When you do something, and everyone believes in it, you should all do it together. There shouldn’t be sheep wandering off,” he added. Email “Ferdinand brothers set to shun FA's 'Kick It Out' initiative”. Feedback on “Ferdinand brothers set to shun FA's 'Kick It Out' initiative”.